More than 2 million square metres of GRC permanent formwork have been used over the years. The most popular application is in bridge construction. 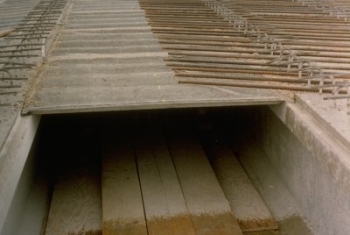 Small (1-2 m span) GRC panels are fitted between precast concrete beams before steel reinforcement and concrete are placed. GRC permanent formwork panels are not only fast to install, they also provide extra corrosion protection to the steel reinforcement. GRC carbonates very slowly and has low permeability providing a barrier to the ingress of de-icing salts. 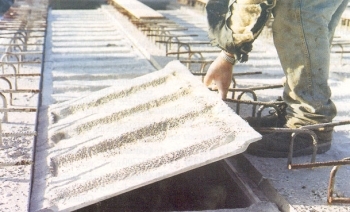 GRC permanent formwork has also proved to be an efficient solution to the world’s ageing sewers. In the UK, France, Holland and elsewhere thousands of kilometres of brick-built sewers have been lined with GRC permanent formwork and grouted in place. Not only does this safeguard the structural integrity of the sewer but also the smooth surface of the GRC enhances the hydraulic performance. In building construction, GRC permanent formwork has been used in innovative ways to produce complex forms and shapes. GRC products reduce loadings on buildings leading to significant savings in superstructure and foundations. GRC is excellent for reproduction and renovation.